The connections between the foreign intervention crisis in Syria, the vast NSA surveillance program that has recently been exposed, and the sequence of events that began with NSA program changes in February, 2001 — six months before 9/11 — are illuminating. 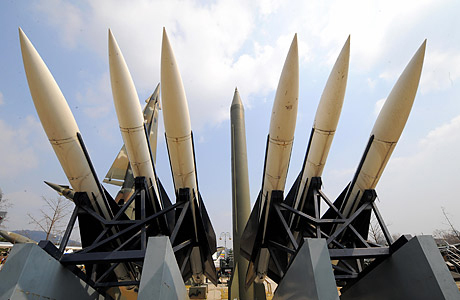 In mid June 2013 the Obama administration announced that it will start arming insurgents against the Syrian government because the regime crossed a “red line” by using chemical weapons — which it estimates have killed, over time, an estimated 100-150 rebels. Foreign Policy just published a roundup of weapons contributed to the Libyan rebels in the regime change effort. The e-Journal is a publication of the Washington Post. Colum Lynch’s April 4 article relies on the March 20 UN report to the UN Security Council by a panel of experts appointed to track the UN resolutions and responses from the start of the conflict. These two paragraphs, noncontroversial in establishment world, outline clear violations of Principle VI (a), (b), and (c), of the Nuremburg Principles, affirmed by the United Nations General Assembly. “As the late Col. Muammar al-Qaddafi’s forces prepared to crush the Libyan uprising last summer in Benghazi, Britain, France, Qatar, the United Arab Emirates, the United States, and other allies moved quickly to reinforce the beleaguered rebel forces. The Arab League has announced it’s reached a deal with Syria on easing the country’s long-running political crisis. The agreement urges Damascus to immediately withdraw security forces from the streets, release jailed demonstrators, and start dialogue with the opposition. Syria also agreed to allow rights groups and Arab League watchdogs into the country. But the U.S. still says it wants to see President Assad resign. The International Criminal Court is due to receive a suit against NATO over the killing of Libyan ex-leader Muammar Gaddafi. But the Gaddafi family’s chances of finding justice in The Hague are all too slim, says journalist James Corbett. In their suit, which cites the “deliberate killing” of a person protected by the Geneva Convention, Gaddafi’s family will target NATO’s executive bodies and the leaders of its member states, their lawyer, Marcel Ceccaldi, said on Wednesday. This morning I had a chance to interview award-winning writer, Prof. Michel Chossudovsky about the Occupy Wall Street movement. Michel Chossudovsky is the President and Director of the Centre for Research on Globalization (CRG). He teaches Economics at the University of Ottawa and his books have been translated into over 20 languages. Go to globalresearch.ca for more information. 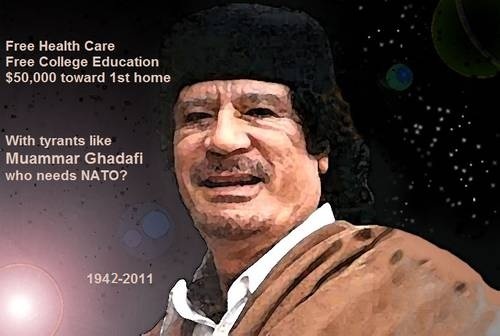 The New York Times reported that a NATO jet and drones disabled vehicles in a convoy carrying Muammar Gaddafi near the besieged town of Sirte on October 20. 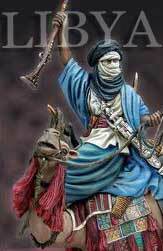 Loyalists in the remaining vehicles scattered becoming easy prey for the emboldened fighters of the new Libyan state. Reuters expanded the narrative on the 21st by reporting that Gaddafi fled from his jeep, hid in a drainage pipe, and emerged with an automatic weapon and side arm. 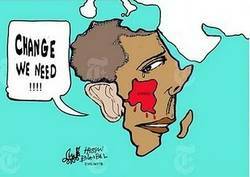 He was manhandled and slapped by the soldiers of the new Libya. He allegedly asked the crowd, “Don’t you know right from wrong?” They took exception to the question and shot him twice in the head. 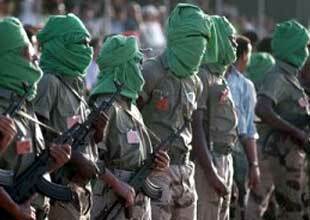 He was transported to Misurata, scene of one of the few decisive victories by the former rebels. Gaddafi’s corpse was placed on a bare mattress and put on display for the public on the 22nd. It remains there today, although it is now reportedly covered by a blanket (Reuters, October 23). Obama’s decision is described in the press as “highly unusual” and “surprising”, even “weird”. It is none of these things. It is the logic of American foreign policy since 1945. At face value, the tenuous narrative of a struggling, desperate NATO confounded by months of fierce resistance on all fronts and an increasingly brutal and transparently atrocious proxy army on the ground in Libya, suddenly wringing victory from what was essentially a catastrophic failure, is difficult to believe. This, especially as NATO desperately needs to turn its full attention toward Syria as the window of its imperial ambitions quickly closes forever. Already, claims that Muammar Qaddafi’s son Saif al-Islam had been captured have turned out to be admittedly false, Reuters finally admits , even after an elaborate tale had already begun spreading through the biased, irresponsible corporate-driven Western media. 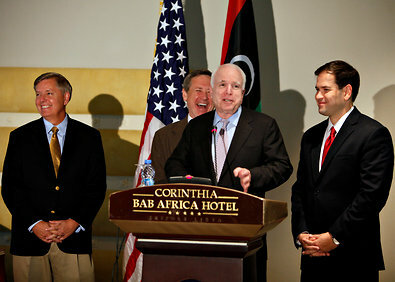 Photo: It’s all smiles and laughs in Tripoli as McCain, a chief proponent and driving force behind the US intervention in Libya, literally glorifies Al Qaeda’s exploits in the now ruined nation. Miles away, the very rebels he was praising were purposefully starving the civilian population of Sirte in an effort to break their will, while they and NATO indiscriminately used heavy weapons aimed at crowded city centers. Dy Yusuf Shakeer, Libyan most famous journalist says that the Libyan leader Muammar Gaddafi is alive. So far, Shaker has not said a single lie, reason why the Libyans listened to him before the NATO bombed its TV channel to silence him. 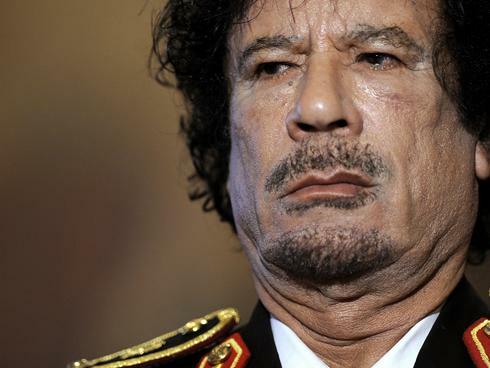 Muammar to Ghadafi is alive and leading the Libyan resistance. 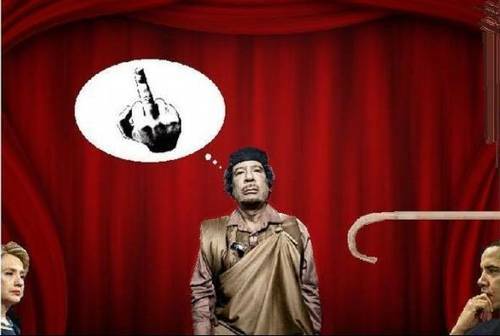 Gaddafi is not dead! His son is not dead! Sirte is still under control of Green resistance! InfoWars: Do You Believe al-Qaeda’s Claim Gaddafi is Dead? 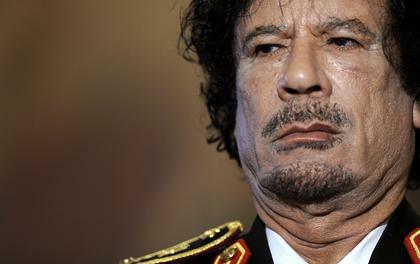 Ousted Libyan leader Moammar Gadhafi was killed today, Libyan Prime Minister Mahmoud Jibril said. 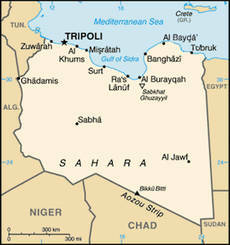 The situation in Sirte is dire. Six weeks under siege after months of aerial attacks. Children and old people dead of hunger and thirst. Water supply hit. Hospitals without medical supplies to treat the ill and injured, and then bombed by NATO. The dead lying in the streets. Constant ‘targeted’ nightly aerial bombardment by NATO air forces. Constant ‘fire at will’ daytime attacks from ill-disciplined NTC rebels using tanks, rockets, mortars and howitzers. In their missile-launcher-laden graffiti-decorated pick-up trucks, the rebels drive into the city edges in the morn and back out by dark, hailed as ‘freedom-fighters’ by their embedded foreign press, they more resemble armed gangs. Roundup of news from za-kaddafi.ru and other independent sources, including that Libyans took out a US paratrooper plane. “According to reliable sources, a series of secret meetings between tribal leaders from Zintan, Libya and Algeria resulted tonight in an agreement that a unified front of tribal militia will enter the war which they call “The War for the Liberation of Northern Africa”. 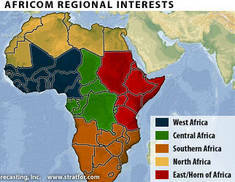 According to the same sources this alliance of tribes is backed by a unified North African Front, including Moroccan Tribes as well as Polisario who is fighting against the Moroccan administration of the Sahrawi Arab Democratic Republic. Oct. 4, 2011 Yesterday NATO and Transitional National Council mercenaries initiated the heaviest assault yet on the strategically and economically important city of Sirte, advancing into the suburbs of the city. After heavy fighting, the attack was ground to a halt this morning. Though heavy fighting continued in other cities, the fronts were relatively calm, which indicates that the TNC is running low on reserves. Is the all-out assault a desperate attempt to register one victory before the NATO Meeting in two days? What do you get when a wannabe imperialist invents a war to get out of trouble at home, straying into deep waters that he neither controls nor understands, getting embroiled in an internecine tribal conflict that spins out of control? The answer to this question is the place where the UK’s David Cameron finds himself now: a 2-bn. pound nightmare. Not so many months ago, we had David Cameron and William Hague declaring that the Libya Question was “not about removing Gaddafi” and that all it would take would be an immediate ceasefire from the Libyan Armed Forces. Not so many months ago we had David Cameron and William Hague declaring that the war would cost in the region of 200 million pounds, that there would be no NATO boots on the ground and that NATO would not arm the “rebels”. A nationwide pro-Ghaddafi resistance movement is slowly gaining momentum as NATO-Al Qaeda and Rebel forces desperately pound southern Libyan cities loyal to Ghaddafi. US-NATO have dispatched around 1,500 foreign Al Qaeda mercenaries from Afghanistan to Libya when several hundreds of rebels were killed during recent offensive on Sirte, bani-Walid, Sabha and other towns loyal to Muamar Ghaddafi. Also the all important oil town of Ras Lanuf has been liberated by Ghaddafi forces and that oil exports by the National Transitional Council (NTC) – initially destined for western colonial masters – should now come to a standstill. 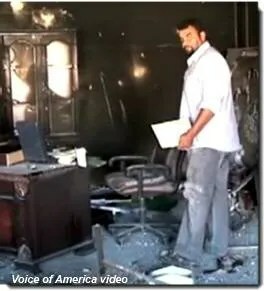 The Washington-led decision by NATO to bomb Gaddafi’s Libya into submission over recent months, at an estimated cost to US taxpayers of at least $1 billion, has little if anything to do with what the Obama Administration claims was a mission to “protect innocent civilians.” In reality it is part of a larger strategic assault by NATO and by the Pentagon in particular to entirely control China’s economic achilles heel, namely China’s strategic dependence on large volumes of imported crude oil and gas. Today China is the world’s second largest importer of oil after the United States and the gap is rapidly closing.